October 7, 2013 November 9, 2013 Posted in Travel Posts. From Nagoya I have retraced my steps a little and started to head south, the bus from Nagoya back to Osaka was simple, you book the bus, get on and then cruise along the highway for three hours, it was very comfortable compared to the roads that I was on in Cambodia and Vietnam. I stayed one night in a very small but perfectly functional hotel for ¥2,000 which is about, this was the cheapest and best option I could find. I headed out in the evening for dinner and a walk, the thing with Japan is that most Restaurants close their doors around 21:30 which leaves you with the option of heading into an Izakaya for drinks and snack like food. Don’t get me wrong the food in an Izakaya has been great so far but it is only snack like stuff usually so if you want something a bit more substantial remember to eat before 21:00, there is an alternative though. You may remember way back on Day 1 when I landed in Kansai and took refuge in the airport I managed to find the magical food machine? Well I found out that this is a thing in Japan and some Restaurants are open and serve a lot later but they use this same method. If you don’t remember (because I didn’t) here it is again? I had actually forgotten the first step and tried to select what I wanted to eat first (this is very normal for western society I think). Luckily some nice older Japanese ladies corrected me in Japanese and I understood enough to know what they were talking about. After eating I grabbed a beer on the way back to the hotel from a convenience store and headed back to my room to write and ponder. At the time I didn’t really feel like mingling with other tourists so I stayed away from the common room, I do this from time to time when I really don’t want to engage with people. The next morning I headed out to Himeji to see (or not see) the castle and this is where we pass over to a little video I made. I hope you enjoy it, however if you have not got the resources to watch it right now please read on. To try and save more money in Japan I have been trying to use Couchsurfing.com. My last experience as you may recall did not go great but with standards the way they are in Japan I was willing to try again. Satoshi san replied to my request and we arranged to meet at Himeji station, after an initial confusion from me about which entrance is which Satoshi found me due my distinctive nose ring, you see Mum there is a purpose for it, it makes me stand out and memorable. I grabbed a map and Satoshi recommended sone things to see and do which was really helpful before we went our separate ways for a few hours agreeing to meet back at the station at 17:00. Himeji castle is still under renovation and I am sure when it is finished it will be a beautiful addition to this quaint little city. Right now you cannot see much but you can walk around the grounds and see the reconstruction work, in typical Japanese form this is all incredibly well organised. You pay ¥400 for the castle grounds & garden with an extra ¥160 to get into the bits of the castle you can get into which included the house the princess lived in. 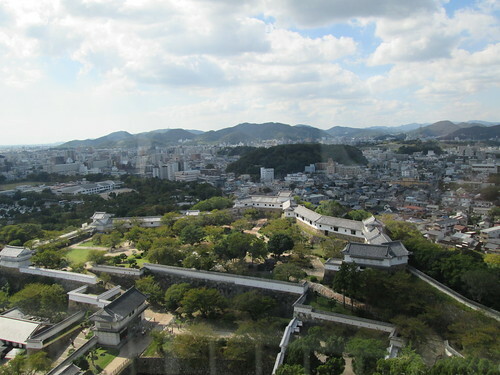 There is an additional charge of ¥200 if you want to go up the top of the castle using the steel beams that have been constructed around it to aid the workers to clean the outside. If you thought the English were bad for forming an orderly queue well the Japanese are experts at it and have this down to a fine art. they even have guidelines on the floor of train stations telling you where you should queue. The view from the top of the construction as you should be able to see is beautiful and you get a real sense of the castle, it’s walls and the surrounding city. Leaving the castle I pass back through the main park which was holding a little festival but I don’t know what the festival was about or why it was happening. There were many food stalls to choose from and in the end I went for some Chicken Kariage, which is just boneless pieces of deep fried chicken but it is delicious and less greasy than the chicken I had in Thailand (I ate a lot of fried chicken in Thailand) I can never again eat bad deep fried chicken, sorry London but you really have no idea how high the standard is out here, even bad fried chicken in Thailand is better than what is available in most places in the UK. With that satisfying my hunger I turned my attention to the festival which was in full swing. Music was playing and people dancing on the stage in some amazing outfits as you can see from above, there was even some cosplay going on which confused me lots (see video). 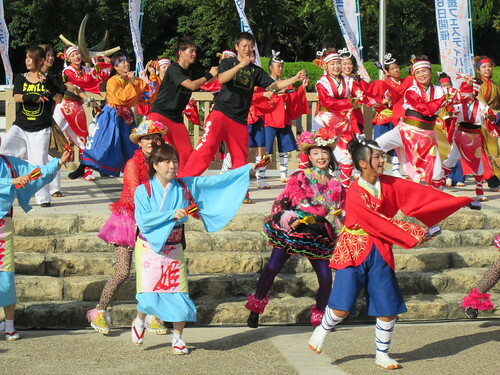 Everyone danced in a big group, and then the individual dance groups. I sat in the shade with lots of Japanese people and watched with interest, from the corner of my vision I spotted 3 or 4 (I can’t remember) tourists standing out the way videoing things on their phones, I wondered why they were standing so far away, there was plenty of room in the crowd and if they took a low profile (not stand in front of everyone) I am sure the locals would not of minded (they didn’t bother me!). I find that tourists tend to do this when out of their comfort zone and myself included at times they tend to bunch together to try and find some sort of normality because their normality has been taken away from them by being in a foreign environment. I felt very safe and even involved right in the heart of the Japanese people sitting in the shade. While I sat there watching emotions rose as it my brain decided to remind me where I am and how I got here. Tears of joy rolled down my face as I sat and listened to the voice in my head say “Look where you are, look at what your seeing and where it is you are seeing it. Be in this place, be here, this is not a dream”. I never can prepare for these moments, they take me totally by surprise and I always pay attention to them and to let myself feel whatever comes up, at times I want to scream out in success, it’s a beautiful moment and I welcome them. Anyway to end the day on a high I met up again with Satoshi and he took me to his apartment which was clean, inside and lovely. I had my own little room with optional closing door. I spent the evening catching up on things and arranging what comes next. I cannot thank Satoshi enough and the small box of chocolate that I bought to say thank you to him seem insignificant but I needed to get him something. He was kind enough to drive me out to a place so we could get dinner and then walked me to the bus stop in the morning. Seriously helpful, Couchsurfing in Japan is a much different experience than Australia.